The Spectrem Household Outlook asks investors to rank four financial components in their lives in terms of how they perceive them to be progressing. In August, non-Millionaires had a higher Outlook than Millionaires, which almost never happens. 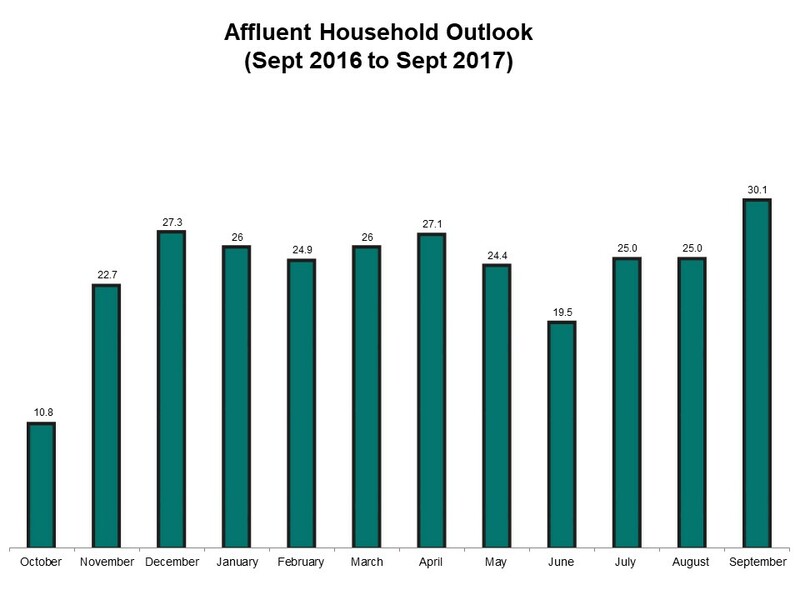 In September, the Outlook returned to normal, with Millionaires registering an Outlook of 36.91, the highest mark since April of 2007, before the Great Recession. Non-Millionaires slotting it at 22.95, a drop of more than 4 points from the previous month. 58.00, up 6 points from August 2017, and the highest mark overall since May of 2015. The rise in Household Assets results from increased confidence among Millionaires, lifting their rating to 70.31, the highest mark for assets among Millionaires in more than 12 years. Investors are asked to guess whether the value of their household assets will be higher or lower over the next 12 months, and obviously, Millionaires overwhelmingly believe they will rise. That feeling is not universal, however. The Household Assets number rose among men and fell slightly among women. Likewise, it rose among Republican investors and dropped among Democratic investors. 28.40, an increase from 22.00 in August 2017. Millionaires are on the high side of the overall number with a rating of 34.37, while non-Millionaires fell to 22.13, their second consecutive drop. But the big news in Household Income is that females reported a higher number than males, 28.57 to 28.33. 17.2, up 9.2 points from August 2017. The Economy mark hit its highest point since April of 2017, thanks to a surge in almost all segments. For Millionaires, the jump was massive, from 2.36 to 20.31, the largest increase since Feb.-Mar. of 2017. Among non-Millionaires, the Economy mark climbed slightly, registering its third monthly increase. Male, female, Republican, Democrat, retired, working - every segment of investors registered an improved score on the Economy in September. 16.80, a decrease of 1.2 points from August 2017, ending a three-month streak of improvement. Here is where Millionaires and non-Millionaires disagreed. Millionaires continued to rate Company Health highly, and in September the mark was 22.66, the fourth consecutive increase and the highest mark for that component among Millionaires since September of 2013. Among non-Millionaires, Company Health fell to 10.66. There was a slight increase among Republicans rating Company Health, but there were slight decreases among males overall.